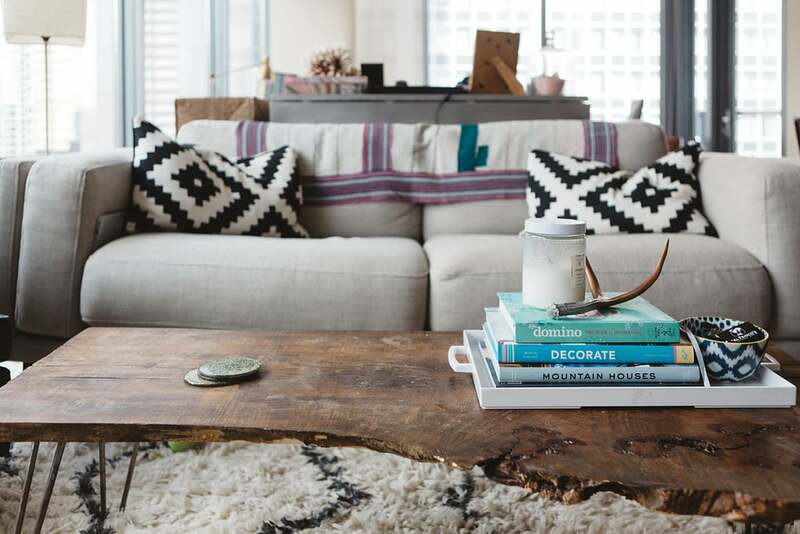 As the voice behind The Fox & She--arguably one of the city's top fashion and lifestyle blogs-- sharing Blair's home with you is such a thrill. Not just because she's a blogging inspiration, but also because her sense of style is one of my personal guiding lights. Blair excels at balance: boho yet classic, muted yet colorful, conservative but unique. I could have picked her home out of a lineup of hundreds because she carries over her aesthetic so authentically. Knowing what's up in the city is also a big part of her job description, traveling far and wide for Chicago's most photogenic, delicious and/or noteworthy spots. We've lived here about ten months. Before moving to Streeterville we lived in Lincoln Park, but really wanted to live downtown before ultimately settling back in Lincoln Park. I really have no idea! Two years maybe?! Probably my little desk area. I love the natural light and looking out over the city from my desk. When we first saw this place, I though the little nook in the kitchen would be the perfect place for my desk. But after moving in, I hated staring at a wall all day, so I quickly moved the desk to its final resting place in front of the window. We have zero storage--and not even a storage cage in the basement. It's a struggle to find a home for everything. We love the River Walk, and are there all the time. Summer tourists! We live just off Michigan Avenue, so pretty much in the heart of it all. Dog walks can be a struggle when all I want is to walk in peace. BYOB drinks on the River Walk! I put on my slippers and walk to my desk--working from home is great! Trader Joe's and Whole Foods are both very close. We'll move back to Lincoln Park when we're ready to start a family since it's such a family-oriented area. Honestly, no. We have a lot of older people that live on our floor--one neighbor does exercises in the hallway! Yes, definitely. We've had no issues. I'd say it's more relaxed than River North. If you want more action though, all you have to do is cross the street! I wouldn't want to live too much closer to the Lake because that means you're further away from everything else. Editor's note: If you're looking to buy or sell in Streeterville, give me a shout!